A memorial fund has been set up in honor of IDSA Fellow and historian Carroll Gantz, who passed away on Nov. 18, 2015 at the age of 84. The fund, set up by Gantz’s brother, Vernon, and associates, will help young people who are aiming to work in arts and design. Donations may be sent to St. Paul's UCC Church, 104 Green Street, Sellersville, PA 18960. Checks may be made out to "Gantz Fund.” “Today’s youth is tomorrow’s future,” says Vernon Gantz. "Carroll was a once in a generation presence," says Austen Angell, FIDSA, and IDSA Board of Directors' Chair Emeritus. "I wonder if designers today truly realize how much Carroll did to preserve the story of our profession?" Gantz holds 30 US design and utility patents. He designed many well-known consumer products including Hoover's 2100 Portable Cleaner in 1964 and Dialamatic upright vacuum cleaner in 1966; and Black & Decker's cordless Dustbuster handheld vacuum cleaner in 1978. Gantz was inducted into the IDSA Academy of Fellows in 1974 and earned the IDSA Personal Recognition Award in 1986. He served as Chair of the IDSA Board of Directors from 1981–1982 and as IDSA President from 1979–1980. The Pennsylvania native earned a BFA in industrial design from Carnegie Institute of Technology, now Carnegie Mellon University (CMU), in 1953. Gantz served in the US Army with the National Security Agency as a cryptanalyst from 1953 to 1956. He became a designer and later industrial design manager for the Hoover Company from 1956 to 1972, and rose to industrial design director at Black & Decker. He also served as professor and head of the Design Department at CMU and in 1986, established a consulting business, Carroll Gantz Design in Charleston, SC. Gantz earned national design recognition from the Industrial Designers Institute (IDI) in 1964 and from the International Design Excellence Awards (IDEA) in 1993. His books include Founders of American Industrial Design, The Industrialization of Design (hailed by a Core77 review as “a treasure trove of information…. With some astonishing details.”), Design Chronicles (co-authored by Matranga) and The Vacuum Cleaner—A History. When Carroll became president of IDSA, he gave me a call, out of the blue. That's how I met him. He challenged me to join the organization and eventually to participate in founding a new chapter in the Pittsburgh area. With irresistible enthusiasm and dedication, he swept many younger designers into IDSA and guided the organization toward rejuvenation, vigorous growth and professionalism. Many years later, when I served as acting head of the CMU Design Department, our search led to Carroll and we selected him as our next department head. I respected him immensely as an organized, goal-oriented but human colleague and role model who knew how to get things done. His quick mind an dry sense of humor made working with him fun. I will miss him . . . . .
Carroll Gantz generously shared his memories of John Vassos, the first Chairman of IDSA, with me as I wrote Vassos's biography coming out this Spring. I am sad that I won't be able to share it with Carroll Gantz who also let me use an image of the ADI logo, designed by Vassos. He has been a great source of encouragement and I always enjoyed our telephone conversations that veered into Black and Decker history and recommendations for the best jewelry shop in Baltimore (Betty Cooke). I first met Carroll Gantz when he formed the IDSA Ohio Chapter to organize designers in more remote parts of the country and it was very successful group of designers eager to join Carroll as professional designers. 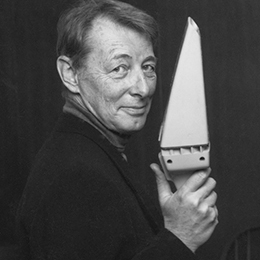 The history of the professional industrial designers became the core of IDSA's value to the membership. IDSA became the standard for any international design organization and the international design community used IDSA as a role model the for ways the organization serves it's membership. I am saddened to hear of the loss of a prominent leader in IDSA and the Industrial Design profession. His significant contributions in Product Design, Design Management and Design Education have truly defined and broadened the Industrial Design profession. Carroll Gantz's life contribution to our profession and society are well known; he was a living legend in IDSA circles. He was also a design historian, an extremely talented writer, and one of the last great thinkers of our professional era. I am proud and fortunate to have had Carroll as a mentor and a dear friend. Thank you, Carroll. Carroll Gantz, FIDSA was solely responsible for turning IDSA from a elderly gentleman's club into an inclusive Society that welcomed all designers who had the minimum educational requirements. Prior to Carroll's Presidency, an applicant had to submit three designs for which they claimed primary responsibility, to an admissions committee that would pass judgement on whether in their sole opinion the candidate was qualified for membership. Carroll was responsible for growing IDSA into the world recognized body that it is today. Carroll was a tireless reminder to us of our history and I think we should all fully understand the history that Carroll himself made in changing the basic structure of the Society for the good of all. Thank you, Carroll. For me Carroll was Mr. IDSA. Along with my mom and dad, Budd Steinhilber, and guys like Dean - IDSA was our annual round-up. Since I was by far the youngest one, Carroll and Budd would always able to set the record straight! Carroll Gantz, the talented industrial design innovator.. An outstanding person, friend, colleague....a leader that not only helped shape the profession of industrial design, but served as a bridge between the generations of the past and those of the 21st century. Thank you, Carroll... Deane Richardson, ICSID senator, FIDSA, Co-founder of FitchRichardsonSmith. My favorite recollection of this great Industrial Design thought leader, historian and business person, was of him telling his favorite story about the iconic DustBuster Vacuum. Carroll was an early advocate of the user is boss. After many months of development of the DustBuster and especially to make it both powerful and quiet, consumer testing revealed a strong disbelief that it was effective, ironically, because it was so quiet. So Carroll argued with Black and Decker that the only remedy was to listen to consumers and make the product noisier, to give users a reason to believe that the thing actually worked. Counterintuitive, yes, but it was a killer in the market and a zillion were sold; noisy as hell. I knew Carroll for the length of my career. He was a tireless contributor to IDSA while I was Executive Director and before and since. His personal encouragement was one of key reasons I became active in IDSA as a young industrial Designer. You could always count on his tough questions at a board meeting and tremendous kindness when one needed some advice. An irreplaceable source of Industrial Design, design-business wisdom and history-keeping.